Team BMC comes to the 2012 Tour de France with a simple goal: win the race. 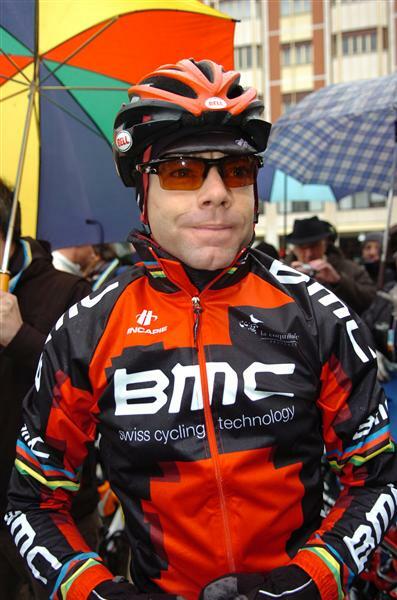 With defending champion Cadel Evans healthy, confident, and fit, the team has a very good chance to do so. Few changes have been made from last year’s squad. Tejay Van Garderen has been signed to help Evans in the mountains while gaining valuable experience for a Tour-assault of his own one day. And of course, Philippe Gilbert was signed this past off-season and will ride the Tour de France hoping he can once again animate the Tour’s first week like last year. But aside from Gilbert’s first week and a possible stage win in front of his Wallonian compatriots during the race’s opening weekend, this team is all about Evans. And why not? The Australian rode a terrifically consistent race last year, claiming victory on the penultimate day after a hard-fought battle from the first stage to the last. This year, things won’t be as easy. First of all, no one seemed to take Evans all that seriously last year—at least not until it was too late. After a career filled with near-misses, everyone expected the Aussie to have at least one bad day—or that his relatively underwhelming BMC teammates would prove unable to defend their captain’s placing when it mattered most. They won’t surprise anyone this year. Second, Evans faces a rider in Team Sky’s Bradley Wiggins who appears to be riding at a level above his peers—with a talented team that has fine-tuned the art of protecting a race lead in Paris-Nice, the Tour of Romandie, and the Criterium du Dauphine. Wiggins and his teammates pose a threat that is likely to be larger than any he faced last July. And while this year’s course looks tailor-made for Evans, it’s equally appealing to Wiggins—a rider who took 2 minutes out of Evans during the Dauphine’s long time trial. Overall, one gets the sense that Evans is once again an underdog at the Tour de France—even a year after he won it. Of course, this isn’t always a bad thing. Despite a slow start to the season, Evans is ready to defend his title. While it’s not quite his race to lose, he’s certainly one of the 2 or 3 riders most suited to this year’s course. Tejay Van Garderen rode his first Tour de France last year with HTC-HighRoad and almost won a stage (he also spent a day in the polka dot jersey). This year he returns as one of Evans’ key mountain lieutenants, while perhaps being given a bigger taste of what it will take to contend himself one day. This time last year, Philippe Gilbert had won more than 10 races and was well on his way to recording one of the most successful seasons of the modern era. This year’s been a different story though, as the Belgian has struggled mightily. That said, winning heals all wounds and Gilbert will have a chance to do so on a Stage 1 course that seems to have been made for him. This spot was originally reserved for Brent Bookwalter—but he’s not riding the Tour this year. Instead, the honor goes to Manual Quinziato, one of the more interesting (and Twitter-friendly) riders in the peloton. Originally hailed as a future classics star, Quinziato has become one of the most experienced and trusted domestiques in the sport—like an Italian version of his teammate, George Hincapie. This entry was posted in Races, Teams and tagged 2012, BMC, evans, philippe gilbert, tour de france. Bookmark the permalink.